We celebrated NET Cancer Day 2016 with the theme “Let’s Talk About NETs”. With support from the International Neuroendocrine Cancer Alliance (INCA), CNETS India distributed disposable cups with “Let’s Talk about NETs” theme. 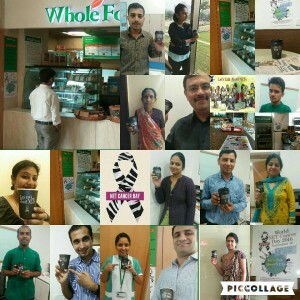 We partnered with Whole Foods India (http://www.wholefoods.co.in), who very generously agreed to use these cups at their outlets in hospitals across Delhi NCR. We put up simple informational posters talking about Neuroendocrine Cancers at their outlets. The initiative was received well both by general public as well as medical personnel at these hospitals. Thanks to all friends who were a part of this awareness drive. Awareness is essential- Lets make each Day NET Cancer Day!